← Shirley Lerch Crum. Nailed!!! Baltimore, MD: PublishAmerica, 2006. Colleen Coble. Tidewater Inn. Nashville, TN: Thomas Nelson, 2012. Libby Holladay is an archaeological historian. Together with her business partner Nicole, she restores historical properties for their wealthy new owners. More than anything, Libby wants to own one of the houses to which she devotes her time and expertise, but at millions of dollars, they are far beyond her means. That is, until Nicole travels to a small island called Hope Island off the coast of North Carolina, where she makes a startling discovery about Libby’s family. When Libby was growing up, her mother always told her that her father died when she was five. But when Nicole mentions Libby’s name to a local attorney assisting with the acquisition of some property, he wastes no time in informing her that he’s been searching for a Libby Holladay for months. Ray Mitchell, Libby’s father, did not die when she was five, but lived on Hope Island until his death just a few months ago. In his will, Ray left his estranged daughter a rundown but historic building, the Tidewater Inn, which stands on a substantial piece of land. Libby is stunned and delighted by her new good fortune, but even more important to her is the discovery that she has two half-siblings. Unfortunately Brent and Vanessa are are neither thrilled to discover they have an older half-sister, nor glad that their father left her what they see as a substantial part of their inheritance. Brent in particular had big plans for the property, involving sale to a major developer who would turn Hope Island from a remote fishing town without access to the mainland into the next Ocracoke. It seems as though Brent’s plans are foiled by Libby’s inheritance, but things aren’t going to well for Libby, either. Nicole is kidnapped by some rough looking men, and a hurricane is bearing down on the Outer Banks. Will she find Nicole in time? 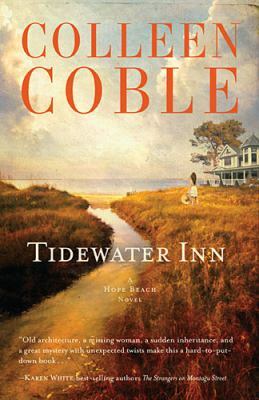 And will the Tidewater Inn survive the storm? Most importantly, will Libby mend the bad blood between her and her newly found siblings, and finally have the family she’s always wanted?